As pet parents, you want the best for your furry friend, starting with the food you feed them. You might find yourself wondering what are the best organic cat foods? Which brands offer the best nutrition? Which foods offer the best cost-value balance? From organic cat foods to natural and holistic cat foods – both as dried kibble and canned wet food – there are plenty of options to choose from. Finding the best organic cat food for your feline companion means reading reviews, studying nutrition labels, and diving into the ins and outs of feline nutritional needs. With the right organic cat food, you can rest assured your pet is getting the best nutrition money can buy. We reviewed dozens of organic cat foods to identify the best of the best, based on Amazon reviews, how well they performed in nutrition tests, cost, and other considerations. We narrowed our search down to 5 of the top-rated natural and organic cat foods pet owners can purchase to ensure a healthy and happy kitty. We’ve identified Organix Grain Free Organic Dry Cat Food as the best organic cat food out there. With organic meat as the first listed ingredient, and no artificial preservatives, added antibiotics, or growth hormones, this organic cat food is one that will keep your cat in optimal health. These benefits will allow your furry friend to live a long, active, and happy life. Who Should Buy Organic Cat Food? Organix Grain Free Organic Dry Cat Food delivers in all areas that are important for pets owners when selecting an organic food for their cat. It features real, organic meat as the first ingredient, as well as organic superfoods such as cranberry, flaxseed, and coconut oil to help provide your cat with the nutrition she needs. There’s no added yuckies, and it has been made in the USA without the use of any ingredients from China. Several pet parents commented that their feline’s skin and coat was much healthier after using this food, and many noted their pet was able to achieve and maintain a healthy weight as well. Other reviewers mentioned how much their cats like the taste of this food over other brands. With an MSRP of $28/4-lb bag, it’s not the cheapest choice out there for organic cat food, but the quality of the ingredients as well as the brand’s commitment to quality craftsmanship more than justifies that price. It has a rating of 4.0 on Amazon with nearly 200 people reviewing it, which we think goes a long way in convincing pet owners that this is the best organic cat food out there. 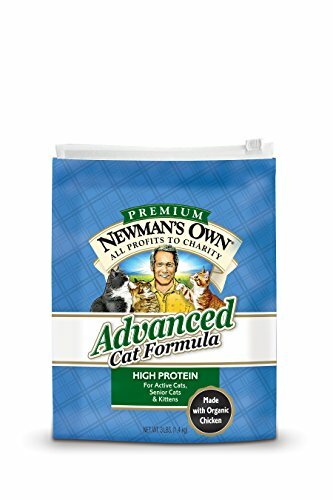 Newman’s Own Advanced Cat Dry Formula is made with natural ingredients, and features organic chicken as the first ingredient. It contains no artificial flavors, colors, or preservatives, and is free from wheat and corn that might potentially upset a cat’s digestive system. Made in the USA using premium ingredients, you can also feel good about the fact that all royalties and after-tax profits from the sale of this food are donated to charity. Several reviewers noted that their very picky kitties ate this food without fuss, and appreciated the list of quality ingredients. Some commented about the cost being higher than conventional cat food, but felt that the decrease in expensive vet bills down the line was worth the trade-off. At a cost of $14/3-lb bag, it’s much less expensive than our top pick, but it doesn’t contain 100% certified organic ingredients. It has a rating of 4.1 on Amazon with nearly 100 people reviewing it, which we think goes a long way in convincing pet owners that this organic cat food is another solid choice for feeding their furry friend. 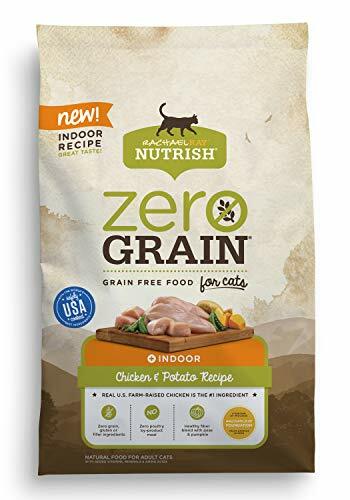 Rachael Ray Nutrish Zero Grain Natural Dry Cat Food might not include 100% certified ingredients, but its impressive list of quality, natural ingredients make it our top pick for those looking for a quality food on a budget. It boasts a grain-free formula that is available in a choice of two different flavors, and includes the added vitamins, minerals, and taurine your feline needs for optimal health. Plus, you can also feel good about the fact that a portion from each sale of this food is donated to charity in order to help animals in need. Pet parents appreciated that there were no added fillers or gluten in this food, with many who left reviews of the product saying that it improved digestive symptoms in their pet with with a history of stomach issues. Some reviews even mentioned that cat poops didn’t smell so bad thanks to this food! At a cost of $31 for a 12-lb bag, this natural cat food is a solid choice for those looking for a healthier cat food option on a budget. It has a rating of 3.8 on Amazon with nearly 300 people reviewing it, which we think goes a long way in convincing pet owners that this budget-friendly pick is just as good at providing the quality nutrition your cat needs as its more expensive counterparts. 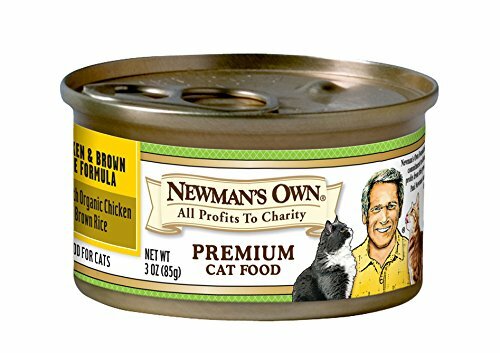 Their human foods feature quality ingredients and are delicious, and Newman’s Own Premium Canned Formulas for Cats is no exception. Featuring organic meats as the first ingredient, this food is made in the USA and boasts an expert blend of protein-packed meat and brown rice to help keep kitties happy and healthy. The recipe also helps to provide an extended energy source while maintaining your pet’s ideal body weight. Pet parents appreciated that this organic cat food was available in a choice of two sizes for big eaters or multi-cat homes, as well as the ability to nourish both kittens and adult cats alike. Several reviews of this food noted that it helped cats with digestive upset, and there were plenty of comments speaking highly of the ingredient list of this food. For a price of $48 you can get 24 cans of 5.5 ounce servings for your furry friend. However, the convenience of the 3 ounce cans might be a better option for some cat owners. This food has a rating of 4.0 on Amazon with more than 500 people reviewing it, which we think goes a long way in convincing pet owners that this organic wet cat food is the best canned choice for their feline. 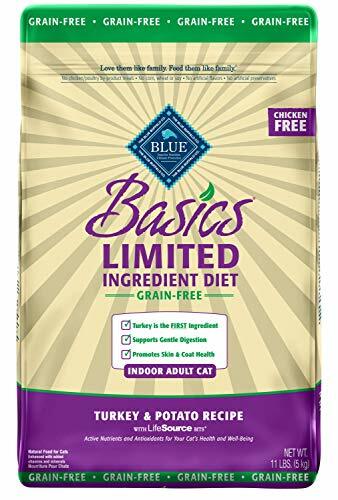 BLUE Basics Limited Ingredient Diet Adult Cat Food is not a 100% certified organic formula, but is does contain a limited list of quality, natural ingredients that make it our top choice for the best organic dry cat food. It contains a single protein source per bag and features a 100% grain-free recipe that’s easier for your cat to digest. It includes pea fiber and pumpkin to help support optimal digestion, as well as omega fatty acids for improved skin and coat health. Pet parents appreciated that this diet was suitable for kitties with even the most sensitive stomachs, and could be fed to adult cats of all ages, breeds, and sizes. Many reviews mentioned that once lethargic cats became more active after switching to this food. At a price of $34 for an 11-pound bag, this cat food is surprisingly affordable. It has a rating of 4.3 on Amazon with more than 200 people reviewing it, which we think goes a long way in convincing pet owners that this limited ingredient cat food is a good choice for their pet. A popular choice for pet parents concerned about the source of ingredients in their feline’s food, organic cat food is becoming an increasingly popular choice. Many people like the idea of feeding their cats food that hasn’t been treated with genetic modification, synthetic fertilizer, or radiation, among other things. While an organic cat food is not a necessity for every feline, those who suffer from food allergies may find benefit in switching to an organic diet. Organic cat food may also be suggested as a way to help senior cats stay lean and fit. While there isn’t strong scientific evidence that indicates an organic cat food is any better for your pet’s health than non-organic cat food, there also isn’t adequate evidence to suggest that feeding your cat an organic food is going to cause them any harm. Ultimately, the choice of whether to feed your pet an organic cat food or not should be made between you and your veterinarian. Life stage. Cats have different nutritional needs depending on their age. Young kittens require diets that are higher in protein and fats in order to help them grow, whereas older cats fare better with diets that are lower in calories as they become less active. Choose an organic cat food that has been formulated for your cat’s specific life stage. Ingredients. Surprisingly, there are still cat foods on the market that contain some questionable ingredients. Look for foods that feature real ingredients, quality protein sources, and added vitamins and minerals to help keep your feline in peak health. Flavor options. Cats are notoriously picky eaters, so having the option to swap up your pet’s food from time to time is an added benefit. Raw food. Cats are obligate carnivores, and naturally hunt for their food in the wild. Since they aren’t cooking their food in their ancestral form, many argue that house cats should also eat raw foods. If you choose to feed your cat a raw diet, it’s important to take precautions as raw foods carry an increased risk of salmonella and listeria. Availability. Organic cat foods are considered a specialty item, so being able to easily pick up another bag or can of food is essential. Check out local pet stores and online retailers to see how easily you can get your kitty’s food. Price point. Finally, consider how much you are willing to spend on an organic cat food. Organic cat food varies in price from $10 per bag/$1 per can-$50 per bag/$3 per can or more. Keep an eye out for manufacturer’s coupons or sales and stock up to make buying organic cat food more affordable. What is organic cat food? 100% organic: All ingredients must be certified organic. Organic: At least 95% of the food’s ingredients are certified organic. Any remaining ingredients must be approved substances. Made with organic: At least 70% of the food’s ingredients are certified organic. Some pet parents believe that organic cat food is better for their pet, but there is little in the way of research to show if this is true or not. That said, the best food to feed your cat is one that is made for their dietary needs and life stage. When it comes to choosing an organic cat cat food, look for symbols that indicate that the food fully complies with the regulations published by the U.S. Department of Agriculture (USDA) and Association of American Feed Control Officials (AAFCO) to ensure your kitty is getting a safe, healthy, and nourishing food. We looked at 20 other organic cat foods. Even though they didn’t make our 5 best organic cat foods list, they’re the best of the rest and each is still a great option for your feline. The information you’ll need to compare each one is included with the listing. This organic cat food features a blend of turkey and liver that has been certified humanely raised, and is suitable for all life stages. With no added fillers or preservatives of any kind, this organic cat food provides cats with the nutrition they need. Ideal for use as a topper on your cat’s kibble or feeding as their main nutrition source, these freeze dried nuggets just need to be crumbled and mixed into water before serving. Suitable for feeding cats at all life stages, this organic cat food features a blend of delicious, organic ingredients to provide your feline with complete and balanced nutrition. This adult cat food has been proven to provide superior digestibility for felines, making it an excellent choice for those with sensitive stomachs. This cat food boasts a grain-free recipe and holistic formula that is excellent for cats with sensitive stomachs, thanks to its moderate protein and fat recipe. Available in a choice of sizes and flavors, this natural cat food is made with delicious, quality ingredients such as real chicken, and has been specially formulated to the health needs of indoor cats. Available in a choice of 3 different sizes and 6 different flavors, this cat food is made with wild-caught or free-range animal proteins, and is suitable for all breeds of cats. This adult cat food is made from natural ingredients that help to promote healthy skin and coat, and includes no artificial flavors, colors, or preservatives. This holistic cat food is available in a choice of two different sizes, and is made with real meat (not meat by-product meal) and a blend of 20 nutrient-rich superfoods ideal for cats with sensitive stomachs. Made using a blend of fresh/frozen and dried meats, this organic cat food contains up to 50% protein in a grain-free formula to help promote optimal feline health. This holistic cat food features a blend of chicken, greens and grains, plus fruits and vegetables to provide an easy-to-digest option for sensitive kitties. This natural cat food has been formulated to provide senior cats with the nutrition they need, while being gentle on their aging bodies. This limited ingredient cat food is suitable for senior cats, and features real deboned turkey as its single-animal protein source, along with easily digestible carbohydrates. Designed to meet the nutritional needs of growing kittens, this organic cat food boasts a grain-free recipe using organic, free-range turkey as its first ingredient. These delicious freeze dried morsels can be used as a topper on your cat’s kibble or feeding as their main nutrition source, and easily rehydrate when mixed with water before serving. Formulated with older kitties in mind, this holistic food is suitable for cats of all breeds and sizes, and contains lean and easy-to-digest turkey paired with mineral-rich whole grains. This canned organic cat food boasts organic, free-range chicken as its first ingredient, and contains no chemical pesticides, synthetic fertilizers, artificial preservatives, added growth hormones, or antibiotics. Suitable for cats in all life stages, this organic wet food features organic chicken, broth, and liver as its first 3 ingredients. 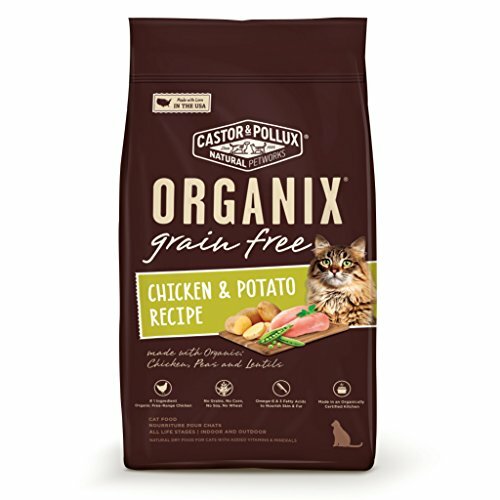 This organic cat food features real chicken as its first ingredient, and is suitable for cats with kidney issues or who get frequent urinary tract infections.